Any seasoned record collector/digger will attest that pretty much every heap of old records in the US (and probably everywhere else, too) probably contains at least one Sandy Nelson album. 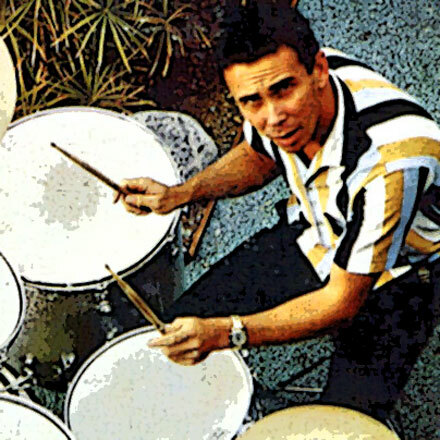 Nelson was a presence on the charts in the late 50s and early 60s with numbers like ‘Teen Beat’ and ‘Let There Be Drums’, but aside from a minor hit in 1964, that was about it. However, like the Ventures, and the Marketts, and the T-Bones and any number of instrumental groups, Sandy Nelson didn’t let a little thing like an absence from the charts keep him from making music. Between 1960 and 1975 Nelson recorded a string of more than two dozen albums for Imperial, Liberty and United Artists, covering pretty much all the styles gracing the pop charts. One might be forgiven for dismissing Nelson at first glance. The garage sales of America are filled with all kinds of instrumental pop albums,most of which look like shameless cash-ins predestined for the cut-out bin. However, I’m here to tell you that you pass over Sandy Nelson at your peril. Though Nelson was a drummer, and most of his albums contain a few drum-heavy features (not necessarily a bad thing, but not always a good thing either…) he surrounded himself with solid players, and he (or whoever was running the show) had pretty interesting taste in music. My first real doorway into Nelson’s discography was via his soul covers, of which there are a number of excellent ones (watch the Funky16Corners Radio Show for more on that). Fortunately yours truly also has a taste for garage, psych and pop, and there’s plenty of that, too. 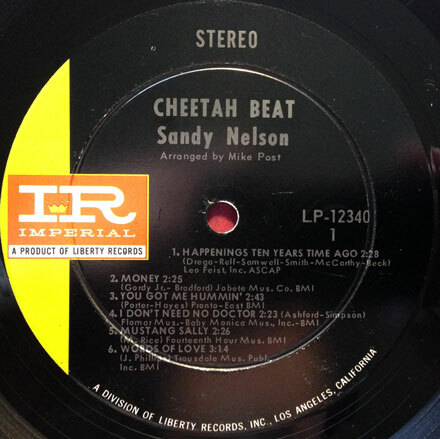 The two tracks I bring you today hail from Nelson’s 1967 LP ‘Cheetah Beat’. When I first picked up the record, I was shocked to see Nelson covering the Yardbirds ‘Happenings Ten Years Time Ago’. Interestingly enough, while their last big hit was ‘Over Under Sideways Down’ in 1966, the Yardbirds continued to have regional hits (‘Happenings Ten Years Time Ago’, ‘Little Games’ and ‘Ha Ha Said the Clown’ were all minor hits in 1966 and 1967) in markets like the Northeast, Texas and Southern California. Nelson’s version of ‘Happenings…’ is nice and tight, with lots of fuzz guitar, organ and (of course) percussion. The song works well as an instrumental, with a very groovy au-go-go feel, sounding exactly like the kind of thing you’d hear in a TV or movie discotheque scene any time in the mid-to-late 60s. The second selection is a cover of the Association’s 1966 ‘Pandora’s Golden Heebie Jeebies’. The Associations best/best-known psychedelic number, ‘Pandora’s…’ was also a minor hit in 1966, hitting in a lot of the same California markets (right in between the mega-hits ‘Cherish’ and ‘Windy’) as the Yardbirds tune. Where the original has kind of a wistful, airy psychedelia, the Sandy Nelson version lays on the guitars, making the song sound more like a Chocolate Watchband outtake. They’re both very cool, and there’s a lot more out there like them. So the next time you’re flipping through a carton of LPs on someone’s front lawn, and you see Sandy Nelson, spend that quarter. You will not regret it. NOTE: I’m away on vacation this week so I thought that I’d reach back in the archives and repost one of my favorite mixes, this one devoted to the various and sundry sounds related to the mighty Curt Boettcher. I should also mention that these songs are not presented in strict chronological order. Boettcher’s career, especially in regard to his vast catalog of work as a producer for hire, and the exceptionally high volume of unreleased material that has trickled out over the years has made it very difficult to place a date on everything. Try as I might I have not been able to track down any information as to who Jacobson and Tansley were. The song presented here, ‘Dream With Me’, though relegated to the b-side of their sole 45 for Filmways (produced by Boettcher) was actually a regional Top 40 hit in the summer of 1966. Opening with some tight percussion, ‘Dream With Me’ is the very definition of pop on its way to psychedelia, even without any of the now clichéd studio tricks. It’s all about the hooks and especially the harmonies. Listen to the way the voices are layered in the bridge, with the backing vocals almost as loud as the leads, creating a kind of natural phasing. Boettcher was spending a lot of time during this period producing a wide variety of one-off singles and ‘Dream With Me’ is a great example of how he put his stamp firmly on someone else’s song via the arrangement/production. ***I had originally placed the formation of the Millennium after the Sagittarius project. Millennium member Michael Fennelly wrote to correct this (see comments in the original post) and I made the change accordingly. 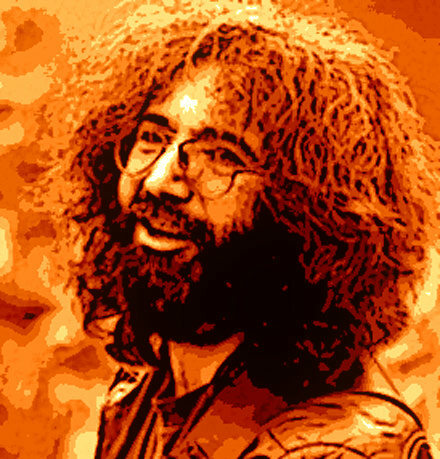 Today, in yet another installment in groovy songs I never thought I’d dig up on 45, we have something from the late, great, Jerry Garcia. Now, I am loathe to waste much space trying to convert anyone – who isn’t already hip to the Dead and their various and sundry offshoots – to the cause, but I will say this. If you are a fan of psychedelic music, improvisation, blues, country or even plain old straight ahead pop, and you don’t dig the Dead because you think it’s some kind of big, gloppy, hippy mess, then it’s your loss cousin. The world is full of people who think everything the Dead ever did boils down into a slightly fried girl with dreads and a tie-dye swirling aimlessly in a stadium parking lot somewhere, and while they’re entitled to their opinion (no matter how wrong it is) I’m done fighting with them. The Grateful Dead don’t need me leading the charge, carrying their standard onto the front lines. However, time to time, I will offer up evidence of their wonderfulness, such as today’s selection. Though Jerry and Bob Weir’s first solo albums are “solo”, they are really part of the larger Dead canon, and much of the material on them was long ago absorbed into the group’s playlists. 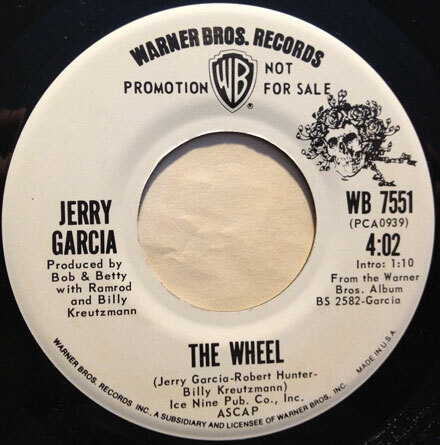 ‘The Wheel’, my favorite track from ‘Garcia’ is a fantastic mixture of the group’s early 70s country rock with a blissful psychedelic undercarriage, delivered sneakily on the wings of a pedal steel guitar. Recorded in 1972, almost completely by Garcia (who played everything but the drums), ‘The Wheel’ has a gentle, yet weirdly diffuse opening, with acoustic guitar, piano and bass seemingly battling for first place, before it all kid of quiets down and the relaxed, loping tempo takes over with the pedal steel weaving in and out of the background. There are hints of a kind of ‘Sugar Magnolia’ vibe, yet ‘The Wheel’ is a much (and it pains me to use the term) “mellower” bag. Back in my days of seeing the Dead in concert, I always thought of ‘The Wheel’ as one of those songs that was absolutely perfect for the psychedelic plateau, if you know what I mean, and I think you do (at least some of you), i.e., that period when the rush has subsided, replaced (optimally) with a kind of laid back, sunshiney cruise control. Jerry’s pedal steel playing is very groovy indeed, and makes me wish (as does the playing of Sneaky Pete Kleinow with the Burritos) that the instrument had been used more outside of a traditionally “country” setting. I’m also wondering if the mix on the 45 is one of the “alternate”mixes included on the CD reissue, since the LP time on the track is 4:12, and the 45 times out at 4:02. If any of you good folks knows the deal, please let me know. So pull down the ones and zeros, and let the goodness wash over you. I have a very special edition of the Iron Leg Radio Show podcast for you this month. It’s an all-Tommy Boyce/Bobby Hart special, including tracks from all of the their A&M LPs, lots of non-LP b-sides, TV-show rarities and the like. Even if you already dig Boyce and Hart, I think you’ll find something new in this episode. If you follow the Iron Leg Radio Show, you’ve probably heard these tunes (and the story behind them) before. Jennifer (in actuality Jennifer Warnes) was a Los Angeles based folk/pop singer and actress who had her first time in the spotlight as a regular on the Smother Brothers show. It was during that time that she recorded a pair of very cool albums for the Parrot label under the guidance of a cat named Marty Cooper. The albums are both excellent and feature a variety of interesting cover material by folks like The Bee Gees, Donovan, the Rolling Stones, Procol Harum, Bob Dylan, Joni Mitchell, as well as some really cool original material, much of it provided by the aforementioned Mr Cooper. 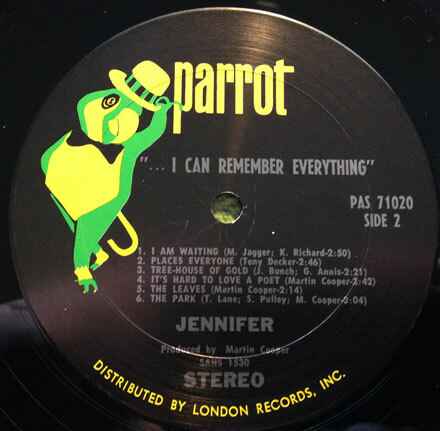 When I started to run down the information of Jennifer’s early albums, I was surprised when Cooper’s name started to pop up in some very interesting places. Cooper wrote songs as diverse as the Marathons ‘Peanut Butter’ and Donny & Marie’s notorious ‘A Little Bit Country, A Little Bit Rock and Roll’, worked with Jack Nitzsche on ‘The Lonely Surfer’, co-produced the Cinders ‘Cinnamon Cinder’ with Nitzsche, wrote and produced a 45 for Charity Shayne aka Catherine ‘Gypsy’ Share, later of the Manson Family, and countless other pop, folk and soul 45s. The man was a regular pop Zelig. Anyway…his work with Jennifer Warnes on those two Parrot albums, ‘I Can Remember Everything’ and ‘See Me Feel me Touch Me Heal Me’ was really, REALLY good. Warnes had a beautiful contralto voice, and the choice of unusual material, mixed with some outstanding baroque arrangements (in this case by the legendary Perry Botkin, Jr) makes for a solid listening experience. Though I originally picked up the albums for her covers of the Stones’ ‘I Am Waiting’ and her versions of a couple of songs from ‘Hair’, the track that really grabbed me – which I bring you today – is a tune called ‘The Park’. Co-written by Cooper with “S. Pulley and T. Lane” (I haven’t been able to find first names for those writers but they got around, having written songs for Mama Cass and Them among others), ‘The Park’ opens with a twangy guitar line and subtle washes of strings. When Warnes comes in, it’s almost shocking how much she sounds like Karen Carpenter (a full year before the first Carpenters record). The song is the kind of thing that was only really happening in the late 60s, mixing a conventional pop feel with touches of far-out-ness. It never really crosses over fully into sunshine pop territory but I can see how it would appeal to fans of the sound. Her version of ‘I Am Waiting’ (long one of my favorite Stones songs) is cool, too, simultaneously fleshing out, and mellowing the original feel of the song. It is also a testament to her versatility as a singer. Both of the Parrot albums are relatively easy to find and inexpensive (maybe 10-20 dollars each). If you get your hands on them, and dig her voice, you should also seek out her somewhat rarer, third album ‘Jennifer’ from 1972, produced by none other than John Cale, which features the cream of the LA scene backing her on some more well-chosen material. It would be another four years before she would break through into the pop charts with ‘The Right Time of the Night’.